A safari in Africa is not often associated with horseback riding. It has since time immemorial been known as a western thing, or even Middle Eastern, but never really African. So many horse lovers who come for safari in Uganda and other parts of Africa do not expect to indulge their love for horses while on their African adventures. However, there are a number of places across the continent where you can get an opportunity to go horseback riding. One of those places is Lake Mburo National park in Uganda. The Horseback Safari is a safe and sane experience. You will be assigned with well trained guides as you venture out for your time in the rolling savannah of Lake Mburo National Park. You do not have to be a very experienced rider to enjoy this amazing adventure. Even an amateur rider will enjoy the horse back safari experience in Lake Mburo national park. You will see some amazing scenery and views of wildlife in Uganda. Some of the animals you might see on your horseback ride include: Giant Elands, Topi, Impala, Duikers, Bushbucks, Waterbucks, Burchell Zebras and so many more. You will also see a variety of bird species, and interesting vegetation. Where do you find the horses? 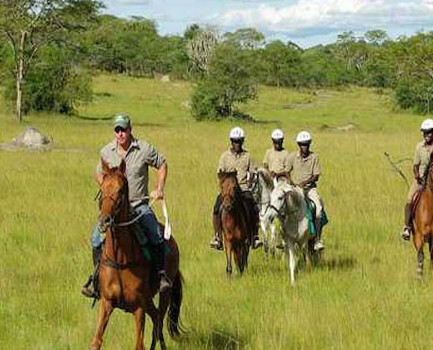 The horseback safaris are run by Mihingo Safari Lodge which has about seven horses and four ponies. Each horseback safari trip can have a maximum of 6 participants or riders, so yo do not have to be worried about the experience being crowded. You cannot afford to miss out on a horseback safari experience while on a Uganda safari trip; you’ll be missing out on a very amazing and exciting opportunity.